The results of a study entitled “Comparison between analytical methods for the determination of the amount of ammonia, Peroxide Value (PV), chlorides and lactic acid aimed at calculating the shelf-life of ricotta cheese” were presented at the 2003 CISET conference. Said study was performed by L’Istituto Sperimentale Lattiero Caseario (Dairy Products Experimental Institute) of Lodi, directed by Prof. Toppino, and was conducted on several samples of ricotta cheese stored at different temperatures. The study enabled to compare the official analytical methods with those of Foodlab. FoodLab® is the preceding version of CDR FoodLab® , the new and implemented analyzer of the CDR FoodLab® range, for which is valid the CDR FoodLab® method of analysis. 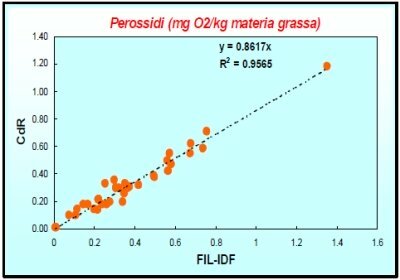 Conclusions of the study: “The method offered by CDR FoodLab by CDR proved to be excellent in some cases and very positive and promising in others, because it enabled to determine the marker analytes and the degree of degradation of ricotta cheese and, generally speaking, of dairy derivative products. This method basically enables to monitor products more frequently and more affordably during storage and distribution“. Testing of Milk and Cheese with CDR FoodLab® and Determination of the Shelf-Life was last modified: May 3rd, 2017 by CDR s.r.l.